Full name not firmly established in Street Fighter; from Thailand. Height: 7'4", Weight: 283 lbs. See this page for Sagat's depiction in the Street Fighter games, animation, and live action. Accessories: purple knife (93 Snake-Eyes's), purple sword (92 Dojo's), purple sword (92 Storm Shadow's), purple sword (93 Snake-Eyes's), purple nunchuks (92 Nunchuk's), two purple handclaws (88 Storm Shadow's), purple figure stand (common). Once called "King of the Street Fighters," Sagat reigned supreme until his narrow defeat at the hands of Ryu. Humiliated at his loss, he now plans to regain the title at any cost. Sagat's Muay Thai fighting style is thought to be the most powerful in the world. With the exception of M. Bison, no other fighter comes close to his overall fighting ability. 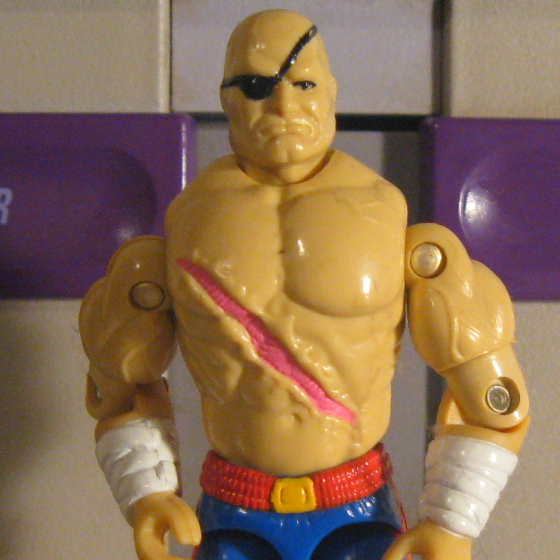 At heart an honorable man, Sagat is tortured by his loss to Ryu and will side with anyone who will give him the chance or experience needed to regain the title. Motto: "You are not a fighter, you are a beginner." Toy Notes: Featured in the Street Fighter commercial. Sagat's arms move opposite each other in a special attack move. Item #81096.